The ultimate Tax Calculator from coinbase. The lunch is as result of the increase in demand on the issue of taxation and cryptocurrencies as contentious topic, on the high demand, we noticed that the U.S. Internal Revenue Service announced in 2014 that it would treat everyone having such assets as being liable to tax rather than, say, a currency. But in the middle of all these complicating topics coinbase lunched a tax calculator. The tax calculator by coinbase is primarily aimed at users who have bought and sold on Coinbase exclusively. Please be advised that this report will only be accurate for customers who have not transacted outside of Coinbase. Do not use this report if you have:p with U.S. tax requirements. 6. Previously used a method other than FIFO to determine your gains/losses on digital asset investments. HOW THE COINBASE TAX CALCULATOR WORKS. First, customers must create a complete view of all digital asset transactions. 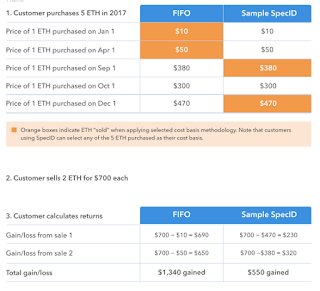 The report provides your cost basis for all purchases and proceeds for all sales, inclusive of Coinbase fees. After determining your cost basis, you and your tax professional can calculate your investment gains or losses. Simply put, your gains or losses are calculated by subtracting your cost basis from the proceeds for each individual sale or exchange. Once you have calculated your gains or losses on your digital assets investments, you are ready to file your taxes. Disclaimer: This post does not constitute legal or tax advice. Tax laws and regulations change frequently, and their application can vary widely based on the specific facts and circumstances involved. You are responsible for consulting with your own professional tax advisors concerning specific tax circumstances. Coinbase disclaims any responsibility for the accuracy or adequacy of any positions taken by you in your tax returns. 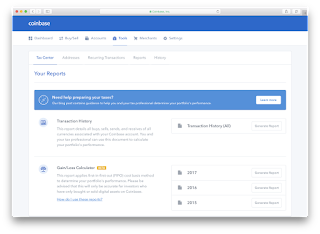 These tools are intended for Coinbase customers filing as individuals, not businesses.